Maha Shivratri or Maha Sivaratri or Shivaratri or Sivaratri (Night of Shiva or "Great Night of Shiva") is a Hindu festival celebrated every year on the 13th night/14th day in the Krishna Paksha (waning moon) of the month of Maagha (as per Shalivahana) or Phalguna (as per Vikrama) in the Hindu Calendar (that is, the night before and day of the new moon). The festival is principally celebrated by offerings of Bael (Bilva) leaves to the Lord Shiva, all day fasting and an all night long vigil. In North India and Nepal, many people consume bhang (Cannabis sativa) , which is believed to be Lord Shiva's favourite drink. There are many stories associated with Shivaratri and its origins. During the samudra manthan (the churning of the ocean) by the Gods and demons, haalaa-hala, a poison, came out of the ocean. It was so toxic, it could have wiped out the entire creation. At this juncture, on the advice of Vishnu, the gods approached Mahadev and prayed to him to protect their lives by consuming this poison. Pleased with their prayers, out of compassion for living beings, Lord Shiva drank the poison and held it in his throat by binding it with a snake. The throat became blue due to the poison (thus Lord Shiva is also known as Neelakantha) and Shiva remained unharmed. The incident shows that Shiva, who may be seen as the divine Destroyer, is also the Protector. In another version, it is believed that the whole world was once facing destruction and the Goddess Parvati worshiped her husband Shiva to save it. She prayed for the Jivas (living souls) remaining in space – like particles of gold dust in a lump of wax – during that long period of pralaya (deluge) night, should, upon becoming active again, have his blessings, but only if they worshiped him just as she did then. Her prayer was granted. Parvati named the night for the worship of Ishwara by mortals Maha-Sivaratri, or the great night of Shiva, since Pralaya is brought about by him. Tripundra refers to the three horizontal stripes of holy ash applied to the forehead by worshippers of Lord Shiva. These stripes symbolise spiritual knowledge, purity and penance (spiritual practice of Yoga), so also they represent the three eyes of Lord Shiva. Wearing a rudraksha seed of the rudraksha tree, said to have sprung from the tears of Lord Shiva) when worshipping Lord Shiva is ideal. A rudraksha is reddish in colour with yellow stripes. On Shivaratri, only cold water and bael leaves are offered to the Lingam. 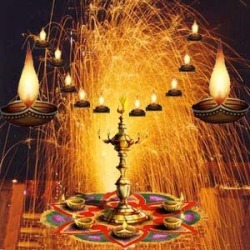 Other traditional offerings, such as bathing it in milk and Panchamruta (a mixture of milk, curds, ghee, sugar and honey) (symbols of sustenance), or annointing it with vermilion (kumkum) or white consecrated rice (Akshata) (symbols of fertility, or creation), are not done on this day, when Lord Shiva is worshipped as the deity of dissolution. Holi, also called the Festival of Colours, is a popular Hindu spring festival observed in India, Guyana, Trinidad, and Nepal. In West Bengal, it is known as Dolyatra (Doljatra) or Boshonto Utsav ("spring festival"). On the first day, burning of the demoness Holika, Prahlad's sister, in a huge bonfires at night. It is called as Kama dahanam in Andhra Pradesh. On the second day, known as Dhulhendi, people spend the day throwing colored powder and water at each other. The spring season, during which the weather changes, is believed to cause viral fever and cold. Thus, the playful throwing of the colored powders has a medicinal significance: the colors are traditionally made of Neem, Kumkum, Haldi, Bilva, and other medicinal herbs prescribed by Ayurvedic doctors. A special drink called thandai is prepared, sometimes containing bhang (Cannabis sativa). 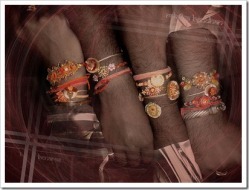 The festival is marked by the tying of a rakhi, or holy thread by the sister on the wrist of her brother. The elder brother in return offers a gift to his sister and vows to look after her same as elder sister return offers to younger brother. The brother and sister traditionally feed each other sweets. It is not necessary that the rakhi can be given only to a brother by birth; any male can be "adopted" as a brother by tying a rakhi on the person, that is "blood brothers and sisters", whether they are cousins or a good friend. Indian history is replete with women asking for protection, through rakhi, from men who were neither their brothers, nor Hindus themselves. Rani Karnavati of Chittor sent a rakhi to the Mughal Emperor Humayun when she was threatened by Bahadur Shah of Gujarat. Humayun abandoned an ongoing military campaign to ride to her rescue. The rakhi may also be tied on other special occasions to show solidarity and kinship (not necessarily only among brothers and sisters), as was done during the Indian independence movement. 1. Indra's fight with Vritra - Indra, the king of devtas (gods), had lost his kingdom to the asura (demon) Vritra. At the behest of his Guru Brihaspati, Indra's wife Shachi tied a thread around her husband's wrist to ensure his victory in the upcoming duel. 2. Draupadi and Krishna during the Rajsuya yagya - After Shishupal's death, Krishna was left with a bleeding finger. Draupadi, the wife of the Pandavas, had torn a strip of silk off her sari and tied it around Krishna's wrist to stop the flow of blood. Touched by her concern, Krishna had declared himself bound to her by her love. He further promised to repay the debt many fold. Many years later when Draupudi was about to be shamed by being disrobed in front of the whole court by her evil brother-in-law Duryodhana, she called on Krishna to help her, and he did by divinely elongating her sari so it could not be removed. One of the earliest origins of Raksha Bandhan in documented history can be traced to the medieval era. During this period the Rajputs were fighting Muslim invasions. Rakhi at that time was a spiritual symbol associated with protection of the sister. History has it that when Queen Karnawati the widow of the then King of Chittor realised that she could in no way defend the invasion of the Sultan of Gujarat, Bahadur Shah, she sent a rakhi to Emperor Humayun. The Emperor touched by the gesture, accepted the rakhi thereby accepting Queen Karnawati as a "sister" and immediately started off with his vast troops to protect Queen Karnavati. Krishna Janmashtami, also known as "Krishnashtami","Saatam Aatham" ,"Gokulashtami", "Ashtami Rohini", "Srikrishna Jayanti", "Sree Jayanthi" or sometimes merely as "Janmashtami", is a Hindu festival celebrating the birth of Krishna, an avatar of god Vishnu. Baby Krishna being carried in a basket, protected by seven hooded serpent, by Vasudeva across the Yamuna river at midnightKrishna Janmashtami is observed on the eighth day of the dark half or Krishna Paksha of the month of Shraavana in the Hindu calendar, when the Rohini Nakshatra (Western star name: Aldebaran) is ascendent. The festival falls sometime during August/September months of the Gregorian calendar. The ritual is to fast the previous day (Saptami, seventh day), which is followed by a night-long vigil commemorating the birth of Krishna at night, and his immediate removal by his father Vasudeva to a foster-home for safe-keeping. At midnight, the deity of the infant Krishna is bathed, placed in a cradle and worshipped.The fast is completed after aarti, a special prayer. In the early morning, ladies draw patterns of little childrens' feet outside the house with rice-flour paste, walking towards the house. This symbolizes the entry of the infant Krishna into his foster-home. This is performed to recreate incidents from the life of Krishna and commemorate his love for Radha. While the Rasa Lila recreates the youthful Krishna's alliance with the milkmaids (gwale) of his native land, the "Dahi-Handi" tradition of Maharashtra re-enacts his childhood pranks, wherein Krishna and his young friends helped themselves to butter and other goodies in the houses of their neighbours. Clay pots called "Dahi-Handi", filled with curd and butter, are suspended high above the ground. To a constant chorus of Govinda, Govinda from all those present, teams of young men form human pyramids to reach the pot and break it. The festival is thus celebrated with great joy and communal togetherness by one and all. Ganesha Chaturthi or Ganesha Festival is a day on which Lord Ganesha, the son of Shiva and Parvati, is believed to bestow his presence on earth for all his devotees. It is also known as Vinayaka Chaturthi or Vinayaka Chavithi in Sanskrit, Kannada, Tamil and Telugu, Chavath in Konkani and as Chathaa in Nepali Bhasa. It is celebrated as it is the birthday of Lord Ganesha. The festival is observed in the Hindu calendar month of Bhaadrapada, starting on the shukla chaturthi (fourth day of the waxing moon period). Typically, the day usually falls between 20 August and 15 September. The festival lasts for 10 days, ending on Anant Chaturdashi . This festival is observed in the lunar month of bhadrapada shukla paksha chathurthi madhyahana vyapini purvaviddha. if Chaturthi prevails on both days, the first day should be observed. Even if chaturthi prevails for complete duration of madhyahana on the second day, but if it prevails on previous day's madhyahana period even for one ghatika (24 minutes) the previous day should be observed. (Ref. Dharmasindhu and Indian Calendric System, by Commodore S.K. Chatterjee (Retd). Madhyahana is the 3rd / 5th part of the day (Sunrise-sunset). Ganesha, the elephant-headed son of Shiva and Parvati, is widely worshipped as the supreme god of wisdom, prosperity and good fortune. While celebrated all over India, it is most elaborate in Maharashtra, Goa (Biggest festival for Konkani people all over the world) Gujarat, Karnataka and Andhra Pradesh, and other areas which were former states of the Maratha Empire. 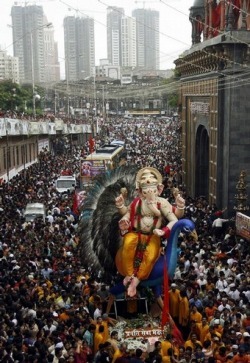 Outside India, it is celebrated by Newars in Nepal and Tamil Hindus in Sri Lanka. 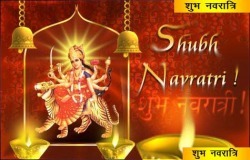 Navratri is a Hindu festival of worship and dance. The word Navaratri literally means nine nights in Sanskrit; Nava meaning Nine and Ratri meaning nights. During these nine nights and ten days, nine forms of Shakti/Devi i.e. female divinity are worshipped. Devotees lit in West Bengal light to celebrate navratri and durga pujaThere are five Navaratris devoted to the worship of Shakti (Parvati or Durga). Out of these only three are being celebrated now. 1. Sharad Navaratri - This is the most important of the Navratris, and is simply called Navratri or occasionally, Maha Navratri (the Great Navratri). It is celebrated during Sharad (beginning of winter, Sept-Oct). It celebrates the slaying of Mahishasura by the goddess Durga. The festival is observed in most parts of India, particularly in Northern India, Eastern India, and Western India. 2. Vasant Navaratri - This is celebrated during Vasant Ritu (beginning of summer) (March- April). This Navaratri is celebrated in North India. Vaishno Devi temple in Jammu observes Navaratri during this period. 3. Ashada Navaratri - This Navaratri is particularly important for all Upasakas of Varahi- Celebrated in July-August. This is called Guhya Navaratri in Himachal Pradesh. Varahi is one of the seven Matrikas of Devi Mahatmya! Vijayadashami also known as Dussehra and Dashain (in Nepali), is a festival celebrated in varying forms across Nepal and India. It is celebrated on the tenth day of the bright fortnight (Shukla Paksha) of the Hindu autumn month of Ashvin or Ashwayuja, and is the grand culmination of the 10-day annual Navratri (nine nights) festival It is the largest festival of Nepal, and celebrated by Hindu and non-Hindu Nepalis alike. The underlying tradition and mode of celebration vary vastly by region. However, all festivities celebrate the victory of the forces of Good over Evil. It is considered an auspicious day to begin new ventures in life. All the people in Nepal, as well as the contiguous Indian hill state of Uttarakhand, celebrate the festival with the greatest importance. In Southern India, Eastern India and Western India, the festival of Navaratri which culminates with Vijayadashami commemorates the legend in which the Goddess Durga, also known as Chamundeshwari or Mahishasura Mardini, vanquishes the demon Mahishasura, an event that is said to have taken place in the vicinity of the present day city of Mysore in Karnataka. In Northern India, the same 10-day festival commemorates the victory of Rama, prince of Ayodhya in present-day Uttar Pradesh, over Ravana, the ruler of Lanka. Deepavali, or Diwali, (Markiscarali) is a major Indian festival, and a significant festival in Hinduism, Sikhism and Jainism. Many legends are associated with Diwali. Today it is celebrated by Hindus, Jains and Sikhs across the globe as the "Festival of Light," where the lights or lamps signify victory of good over the evil within every human being . The festival is also celebrated by Buddhists of Nepal, particularly the Newar Buddhists. According to one theory Diwali may have originated as a harvest festival, marking the last harvest of the year before winter. In an agrarian society this results in businessmen closing accounts, and beginning a new accounting year. The deity of wealth in Hinduism, goddess Lakshmi is therefore thanked on this day and everyone prays for a good year ahead. This is the common factor in Diwali celebrations all over the Indian subcontinent. Oil lamps on the eve of Diwali.The festival marks the victory of good over evil, and uplifting of spiritual darkness. Symbolically it marks the homecoming of goodwill and faith after an absence, as suggested by the Ramayana. On the day of Diwali, many wear new clothes and share sweets and snacks. Some North Indian business communities start their financial year on Diwali and new account books are opened on this day. Return of Lord Rama to Ayodhya: Diwali also celebrates the return of Lord Rama, King of Ayodhya, with his wife Sita and brother Lakshmana to Ayodhya after a 14 year exile, and a war in which he killed the demon king Ravana. It is believed that the people of Ayodhya lit oil lamps along the way to light their path in the darkness. Since Lord Rama traveled from South India to his kingdom in North India, he passed through the south earlier. This is the reason why the festival is celebrated a day earlier in South India. 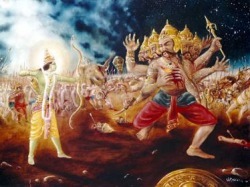 The Killing of Narakasura: Celebrated as Naraka Chaturdasi, two days before Diwali day, it commemorates the killing of Narakasura, an evil demon who created havoc, by Lord Krishna's wife Satyabhama. This happened in the Dwapar Yuga during this time of Lord Krishna's avatar. In another version, the demon was killed by Lord Krishna (Lord krishna provokes his wife Satyabhama to kill Narakasura by pretending to be injured by the demon. Narakasura can only be killed by his mother, Satyabhama) himself. Before Narakasura's death, he requested a boon from his mother, Satyabhama (believed to be an Avatar of Bhudevi - Narakasura' mother), that everyone should celebrate his death with colorful light.